I often talk about how I cherish the rare and unique opportunity to experience a film through pure, unbiased eyes, having never seen a trailer or a clip, with no knowledge of even a basic premise to get me started before sitting down and pressing play. Such was my approach to the 1971 Australian movie Walkabout, as I literally only knew the name of the director and the fact that it was deemed worthy of inclusion to the Criterion collection. I wanted Nicolas Roeg to tell me a story, to paint something extraordinary with his highly regarded brush that, despite his expansive filmography, I had never witnessed in action before. The film starts with various shots of crowded, typical cityscapes, yet what gives these moments a unique flavor is the usage of didgeridoo music to accompany them, an odd blend of the chaotic and routine with an instrument developed by Indigenous Australians a long, long time ago. It didn't take long for me to recognize that I was not in for a traditional, run of the mill piece of cinema. Suddenly we find ourselves in a very different setting, the Australian Outback, with a Father (John Meillon) and his two children, a teenage daughter (Jenny Agutter) and much younger son (Luc Roeg). They seem normal. Everything seems relatively normal, but I couldn't help but wonder, why were they choosing to park their car here? Was this a spot they enjoyed for a bit of peace, a serene escape from that hectic, urban life? Seemingly without rhyme or reason and with no warning, the Father pulls out a gun and begins shooting at his children, who effectively hide from the bullets. He lights their car on fire and kills himself, stranding his children in the middle of nowhere. My jaw hit the floor, and this all occurs within the first 10-15 minutes. Welcome to Nicolas Roeg's Walkabout. Things quickly seem hopeless for them as they try to survive on their own, having obviously not prepared in any way for this journey. Even when they are lucky enough to find water and a place to rest, by the time they wake the next morning the world that surrounds them is back to being dry and desolate. I was watching Walkabout on my beautiful television in my living room, bottle of water in hand, yet even I was feeling the effects of the powerful sun and the seemingly never-ending vastness of the region. To face a certain death at such an age because of the actions of their father, actions that will never be properly explained nor understood by such young minds, it's a haunting and troubling thought. In the distance they see a figure, the outline of a an Aboriginal Australian boy (David Gulpilil) currently in the midst of his "walkabout", a ritualistic experience that transitions them from a boy into a man as they are expected to fend for themselves for months utilizing the skills they have learned and are needed to survive. Thus begins a walkabout of sorts for all three of them, as during their journey the two young people who are used to city life experience something profound that isn't spelled out by Roeg, but we can see it, we can feel it even if it's difficult to put a finger on what we are seeing and what we are feeling. Even if they survive, will their previous normalcy ever feel normal again? For a brief period of time during Walkabout, I was trying too hard to analyze exactly what Roeg wanted me to extract from his narrative until I literally told my mind to stop. Searching for the "right" answers, some universal truth placed inside such a fascinating and unique story seemed to fly directly in the face of what Roeg was actually trying to accomplish here. Once I simply opened my mind to the experience and let it flow naturally, I felt like I was going on a walkabout right along with the characters. Early on in the film I saw the setting as desolate and hopeless, but with each passing minute the landscapes, or at least my perception of them changed. Now I felt calm, open, and free, and the fact that I watched this alone in a quiet, pitch black room really allowed me to soak up the world these characters traveled through, a world far different from mine. The moments that have really stuck with me since viewing this film are those in which Roeg does some really fascinating work intercutting scenes of life in the wild with imagery "civilized" people find typical and normal. 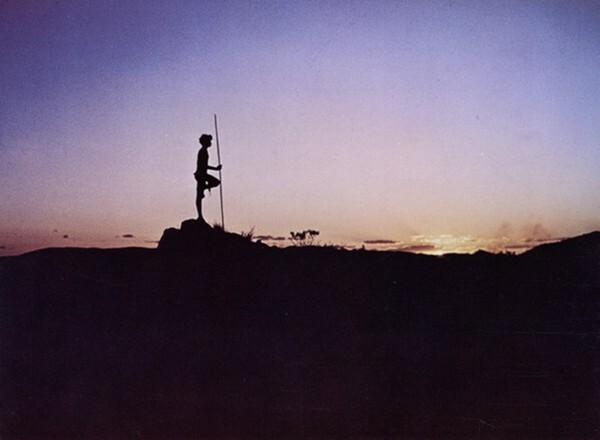 The Aboriginal boy is seen killing a kangaroo with his spear, and it feels barbaric and heartbreaking and wrong, watching this helpless animal die in such a brutal fashion, but Roeg cuts away repeatedly to show a butcher routinely cutting meat. As I watched this scene unfold, I wondered why I found the actual death of the animal so devastating and yet felt nothing watching the meat of a creature be turned into serving sizes for the dinner table. If anything it should be the opposite, in the wild such an action is literally necessary to survive, and while the death of anything should be mourned, the fact that the life of one creature assisted in the health of another should be celebrated. It is a natural function of the ecosystem, where as walking into a butcher shop to purchase animal meat by the pound when you are not going hungry, when you are surrounded by other options to nourish your body, something about that felt completely unnatural and unsettling the more Walkabout washed over me. Walkabout begins and ends in strikingly similar and yet very different ways. I have spent a lot of mental energy trying to piece together why the father did what he did during the first act of the film, and I can't make any sense of it. I have spent an equal amount of brain power on the fate met by another character in the film during the last act, trying to understand the motivation behind it, but I continue to come up empty. This might sound frustrating, but actually I admire the hell out of a movie that resonates strongly enough to not only make me work after it's over, but more importantly makes me want to work days later. I still can't pretend to be familiar with the body of work Nicolas Roeg assembled, but it's obvious he has no intentions of spoon feeding answers and peeling back the thematic layers for the audience. 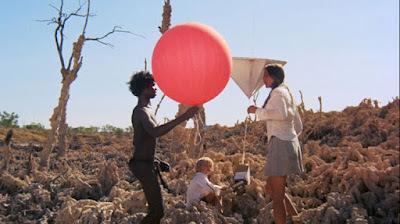 Walkabout is a rich and somewhat surreal cinematic experience, one that I can't stop replaying in my mind. In a literal sense I have never stepped foot anywhere near the Australian Outback, as it's on the other side of the world from the place I call home. Despite this, I not only feel as if I was there recently, I can't shake the notion that I still haven't left. Interesting to hear about these changes, since this is the first time I have seen it, I wouldn't know what might be different from the original version.